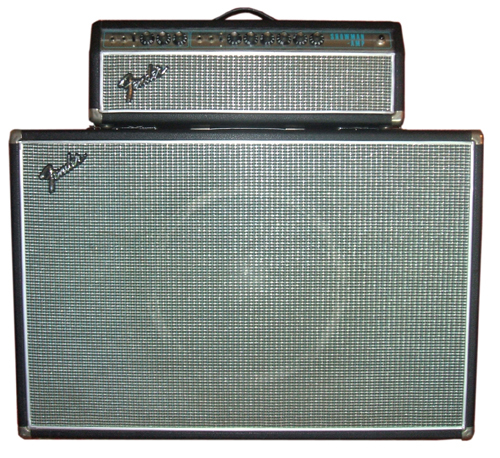 Comments: The Showman 15 and Dual Showman cabs were discontinued at the end of `68 but the head was available until `70.
ohms rating is incorrect , showman 15 cab = 8 ohms , dual showman head had 4 ohm output trans . I ACtually thought the dual showman was 2 ohms??? I could be wrong. Two 4 ohm d-130s in parallel??? Does anyone know how much these are worth today? Just got all the electrolytic caps, & tubes replaced, in my “68” Fender Silverface Showman, one thing I noticed checking it: on the tremolo #2 channel the gain in lower, and the bass knob has to be up or there is no output (on the #1 channel, treble & bass can be on 1 setting and still get output)… is that normal? These are quite possibly the greatest amps ever if you are after CLEAN. That’s my amp in the photo up yonder. it punches you in the stomach when the volume is pushed. I’ll never sell it. And they are a bargain! having known leo fender and George fullerton and having an ear to tell the difference and being an electronic technician my self I have seen more poor quality in the black face modles tinny pearcy sounds one I bought brand new 2 years ago a black face modle was so tenny the whole band said carry that junk back. my old silver face has a ritch full dynamics tone all highs and lows of any amp. has always worked great. all this alleged imfo about the silver face being bad is just not true. look at some beatles pics silverface and Duane allman mussle sholes,wilson pickett and albert king on and on the silver face are great that is the facts. get a schematic explain in detail what you think is alterd. There’s a guy in my town that has this head and wants to trade it for one of my amps, at first glance, it looks in very good condition, tubes turn on and look in excellent condition, however, it doesnt sound with a big clean headroom and the vibrato doesn’t work. That amp that i was gonna trade had an output of 16 ohms, in a cab of 16 ohms, i tried the showman with this 16 ohms cab and another one of 8 ohms. aNy ideas? and one more question, so the cabinet that came along was 8 ohms and the head output 4 ohms? I have one of this and i love it, i bridged the channels and it sounds gorgeous. So versatile, big clean. I paired with a JVMC212 and it sounds amazing. I also used it with a M412B and it sounds good too. Can anyone describe the difference between the AA763 and the AB763 schematics? I wee people discussing a “Blackface Mod” being made to the Silverface Models. There is no difference. One small part was changed in the Vibrato circuit.